Tens of thousands of sailing and steam vessels have plied the Great Lakes, driving America’s economy forward. Yet every ship is a world unto itself, with a history—and sometimes a legacy— all its own. 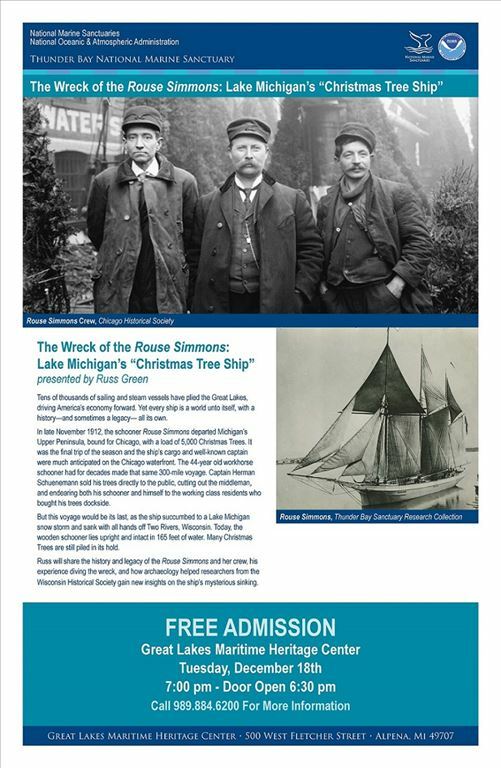 In late November 1912, the schooner Rouse Simmons departed Michigan’s Upper Peninsula, bound for Chicago, with a load of 5,000 Christmas Trees. It was the final trip of the season and the ship’s cargo and well-known captain were much anticipated on the Chicago waterfront. The 44-year old workhorse schooner had for decades made that same 300-mile voyage. Captain Herman Schuenemann sold his trees directly to the public, cutting out the middleman, and endearing both his schooner and himself to the working class residents who bought his trees dockside. But this voyage would be its last, as the ship succumbed to a Lake Michigan snow storm and sank with all hands off Two Rivers, Wisconsin. Today, the wooden schooner lies upright and intact in 165 feet of water. Many Christmas trees are still piled in its hold. Russ Green will share the history and legacy of the Rouse Simmons and its crew, his experience diving the wreck, and how archaeology helped researchers from the Wisconsin Historical Society gain new insights on the ship’s mysterious sinking.